Synopsis from Goodreads: NEW YORK CITY AS YOU’VE NEVER SEEN IT BEFORE. Alright this is what…my 4th review now? So hopefully you’ve taken some time, read my other reviews, and maybe you are starting to pick up what I’m laying down about the types of books I enjoy. Well here’s a little known secret about yours truly…. every once and a while, I enjoy a good old trashy chick-lit type of read. Especially in the summer time. That’s exactly what I was thirsty for in this late August heat and that is exactly what Katharine McGee was serving me: pure, unadulterated chick-lit perfection, ideal for reading pool side or lazing on a sandy beach. However, this wasn’t your typical chick-lit type of read. This book is set in 2118 in Manhattan and follows a group of rag tag teens, some typical rich kid, socialite “highliers”, some middle class called the “Mile high club” and some were poor and lived in the larger lower levels called downtower. It’s been referred to often as a futuristic Gossip Girl meets Pretty Little Liars and I second that. It gave me similar feels that those other two series did (in a positive way… Like I said, I am a closet chick-lit fan and enjoy a good GG/PLL type of story every now and again!) 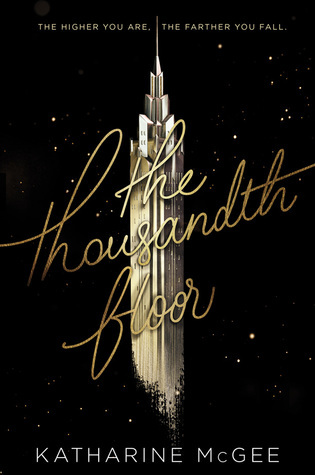 So if you enjoyed those two books, I believe you will enjoy The Thousandth Floor as well. I found that I could not stop reading this book! I picked it up three days ago and have read it every free moment I got (which isn’t very often with two toddlers!) I was shocked when I first began writing this review and was typing up the quick fact sheet I include about the book before my review that says this book is 448 pages long. Not that that’s an awful lot but it is for a momma of two that hasn’t read something nearly of that size in that short amount of time since the Harry Potter days (don’t act like when those last few books came out you didn’t lock yourself in your room for the weekend after standing in line at Waldens Books until midnight and read those bastards in one sitting! I’m looking at you Half blood Prince! You know you’re still my number 1!) Bottom line: this book was an easy read, it kept my attention, and honestly the ending left me wanting more. I actually didn’t realize it was going to be a series at first so when it ended, I sort of panicked but I immediately went to Amazon to preorder The Dazzling Heights which will be released on August 29th! Overall, this book for me is a solid 4 stars. There are a few things that didn’t sit quite right with me that I called into question but weren’t significant enough to change my overall pleasant experience of reading this book. Personally what bothered me the most about the book wasn’t anything the author did wrong but just that I simply wanted to know MORE about what Manhattan was like in 2118 and why the tower was built and a little bit more of its origin story. She did reference to the times before the tower was built which gives the impression it’s not terribly old but I still wanted more world building! Perhaps I will get my wish in the second installment! I enjoyed this read. I do recommend it for a quick end of the summer read if you are looking for something to read at the beach or pool. I recommend grabbing yourself a fruity drink (Strawberry ale perhaps?!) plop yourself down poolside and become immersed into the world of The Thousandth Floor.